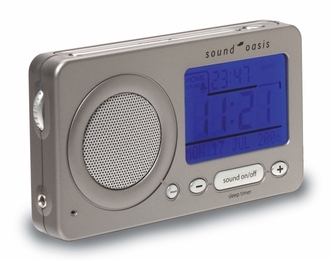 Sound Oasis Travel Alarm Clock is a unique sound therapy product that combines high performance digital sounds with a full-featured travel alarm clock. Incorporating 18 digitally recorded sounds and a voice memo feature, Sound Oasis Travel allows users to drift off to sleep with soothing nature sounds and wake up to one of three alarm sound types (sound, voice memo or beeping). Powered by 4 AA batteries or the included Global Connector Power Pack which includes all 4 international plug adapters so you can plug in virtually anywhere on the planet, Sound Oasis Travel is ideal for use while traveling or at home. Its compact size allows the unit to comfortably slip into your briefcases, carry-on luggage, your purse, or even a jacket pocket. Sound Oasis Travel incorporates a multi-position timer (with 4 selections: continuous, 30, 60, and 90 minutes), a unique gradual off volume reduction feature for a peaceful decrease in sound volume, a rotary on/off volume control, headphone jack and a one-touch off/resume button that stops the unit or repeats your last played sequence. Timer with 4 positions: continuous, or 30 min., 60 min. and 90 min. auto shutoff. Rotary volume control with gentle off so a sudden silence will not wake you. Global Connector Power Pack (included) allows for worldwide use, with nothing else to buy. Travel friendly size: just 11.5cm (5.5") long by 7.5cm (3") wide so it fits neatly in a bag or purse. Sound Oasis S-850 Top Quality Travel White Noise Alarm Clock (Free Ground Shipping!)5T. FaulknerNovember 19, 2013Two features made this product extremely useful given my situation: A necessary need to block the noise of what sounds like monster trucks racing up and down my street every Friday and Saturday night (all night long). A headphone plug-in was a must, as was a method of playing sound all night long: This model has several timed settings and one that allows "playback" until you manually shut it off. It is also great that one of the nineteen sound settings is one that seems to provide just the right amount of bass and monotony to help me sleep quickly and thoroughly; the others I find quite annoying or, worse yet, interesting (the kiss of death when you just want to sleep). But, I allow for how everyone has their thing. My point being, that there is so much to choose from, I believe that most anyone would find their pet setting. One thing to watch for: Because I was impatient to block as much noise as possible, I would turn the sound as high as it would go (there is a beep at the highest setting, and it will not let you turn it up any further). After several hours of this, my ears would ring. Not good. By experimenting, I have found a happy medium of volume wherein most of the sound is masked and I'm not doing any damage (if ringing ears is an indicator of this, which I believe it may be).